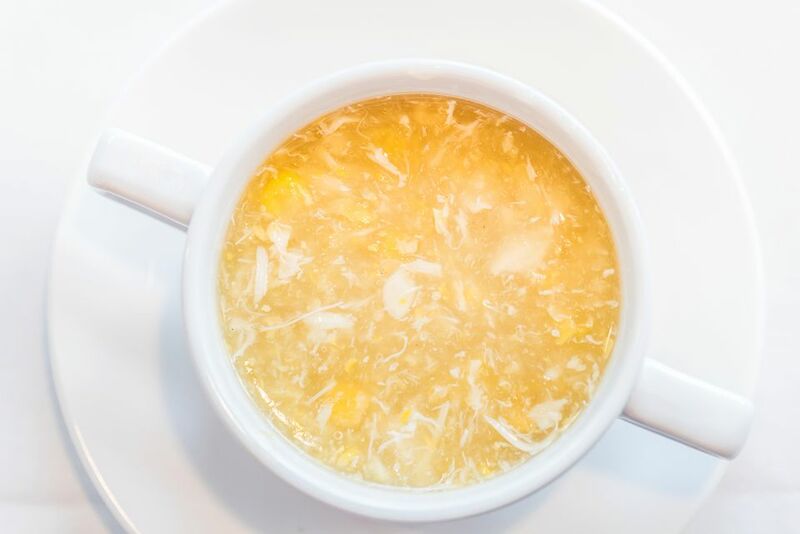 Traditionally, this warming Cantonese soup is prepared in the same way as “Chicken Velvet” by chopping the meat or seafood into small pieces and mixing it with egg whites, liquid, and cornstarch. This recipe for cream corn soup is much simpler – the cornstarch and water mixture is used as a thickener, and the egg whites are streamed into the hot broth before serving, just like in egg drop soup. White pepper, green onions, and Asian sesame oil add extra flavor to the broth. Bring the broth or stock to a boil in a saucepan over medium heat. Stir in the creamed corn and bring back to a boil (about 3 minutes). Stir in the salt, sugar, white pepper, rice wine or sherry, and cooked crabmeat. Cook for about 2 minutes to bring back to a boil again. Give the cornstarch and water mixture a quick re-stir, and then pour into the boiling soup, stirring to thicken. When the soup has thickened, remove the saucepan from the heat. Pour the egg whites into the soup in a steady stream, and quickly stir in a clockwise direction until they form thin shreds. Add the sesame oil and the green onions for garnish if using.